Veneers are an excellent way to redesign and reshape your smile. 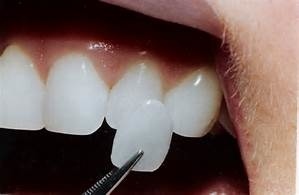 Veneers are a very thin ceramic facing that covers your existing tooth structure. In placing these new veneers on your teeth, you are able to fix the look of issues such as staining, cracked teeth, spaces, misaligned teeth, chipped teeth and many other issues. We use the Cerec system, CADCAM technology, so doing veneers is easy and with no extra cost, extra appointments or numbing and no goopy impressions. and designed right in front of you! This way we can bring your dream to life. We use the highest quality of porcelain blocks with hundreds of choices of shades, plus we can custom shade your veneers while you are here. It makes for a long appointment, but well worth it. For more than 2 veneers, due to milling requiring 1 tooth at a time, we will place temporaries and mill them so you don't have to wait. A second appointment would then be arranged for bonding.